One of the advantages of flow chemistry is that is offers the opportunity of inline analysis. FutureChemistry has proven that their flow chemistry instruments can easily be connected to several analysis tools, allowing inline analysis. 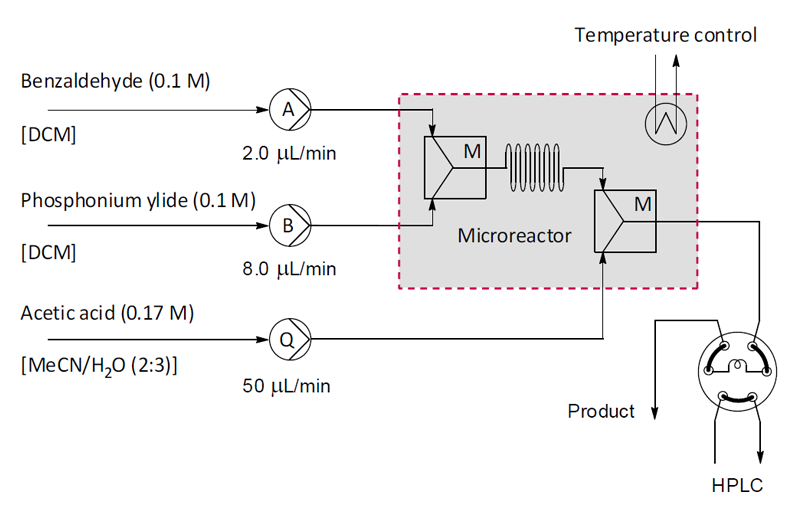 The Wittig reaction is used as a model reaction to monitor the outflow of a microreactor during predetermined intervals, using an inline HPLC method. A conventional Shimadzu HPLC system was coupled to the FlowStart B-200 microreactor system with a 6-port valve, which was automatically controlled by the HPLC software. This setup provided continuous, automated feedback on the conversion and stability of the process, without the need for sample-taking and subsequent work-up steps. The Vilsmeier-Haack formylation of aromatic compounds is a well-established process in organic synthesis. Industrial-scale production, however, is often hampered by laborious procedures. 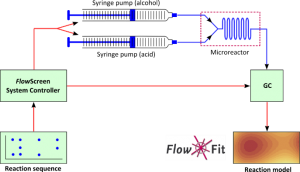 In order to circumvent these issues, a flow chemistry approach was developed using Inline IR-Analysis. The Fischer esterification was used as a model reaction in an automated optimisation, using an inline GC method. Researchers at the Radboud University Nijmegen, Twente University and FutureChemistry have developed a microfluidic high-resolution NMR flow probe. They have shown a model reaction being followed in real-time. The combination of the uncompromised (sub-Hz) resolution and a low sample volume can prove to be a valuable tool for flow chemistry. The application note describes the automated analysis of a continuous flow process using the FlowStart B-200 and a Shimadzu LC2010 HPLC system. Login to the portal of FutureChemistry to download the application note.